Whey Protein is a 100% natural protein concentrate of Whey and is specially ultrafiltered under low temperature to be low in fat, lactose and carbohydrates. Whey Protein is a rich source of glutamine-rich biologically active proteins. Fifty-one percent of the proteins found in Whey are from BLG (Beta-Lactoglobulin), 20% of Whey is ALB (Alpha-Lactalbumin), 10% Immunoglobulin, 10% Albumin, 7% minor fractions (Beta-Microglobulin, lactoferrin, lactoperoxidase, lysozyme, lactolin and relaxin). Albumin is of particular interest to researchers because of its elevated concentrations of glutamylcysteine, a precursor to the antioxidant glutathione. Whey Protein supports muscle development because it is the richest natural source of BCAAs (Isoleucine, Leucine and Valine), important fuel components of muscle tissue. BCAAs are depleted from muscle tissue following strenuous exercise, which can cause catabolic loss of protein. BCAAs suppress proteolysis which is the breakdown of muscle tissue. BCAAs are important as a metabolic fuel for muscle and other tissues by its involvement in the alanine cycle (a process of energy production from BCAAs). BCAAs have been known to enhance performance in moderate as well as intense exercise by improving endurance. Each scoop (27 grams) of Whey Protein provides a total of 4.0 grams of BCAAs. No other source of protein provides as much BCAAs as Whey. Jarrow Formulas 100% all natural Whey Protein is rich in glycomacropeptides, which are biologically active proteins that improve the digestion and absorption of nutrients, and growth of bifidobacteria. Whey Protein, is manufactured using a vegetarian rennet ezyme and is specially processed to concentrate and preserve glutamine. Predigested Whey, such as that found in peptides and hydrolyzed Whey products, results in a loss of glutamine. Therefore, Jarrow Formulas Whey, is NOT hydrolyzed. Also, Whey Protein, is extremely rich in essential amino acids that raise the biological efficiency of the protein. 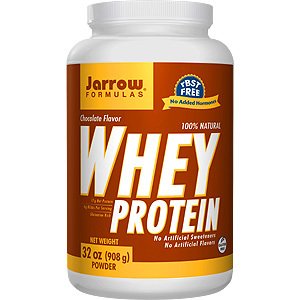 Jarrow Formulas Whey Protein, manufactured in Wisconsin, is state certified to be Grade A quality and does not contain pesticides or herbicides and is negative for antibiotics (each batch is tested for antibiotics). Mix one level scoop (provided in container) of 100% natural Whey Protein with 4 to 6 oz. of cold water, soy-milk, juice or your favorite beverage. Take 1 to 2 servings daily after exercise, or as directed by your qualified health consultant. Other Ingredients: 100% Ultrafiltered Whey Protein (comprising major isolate fractions: 51% Beta Lactoglobulin, 20% Alpha-Lactalbumin, 10% Immunoglobulin, 10% Albumin and 7% minor fractions, betamicroglobulin, lactoferrin and relaxin), fructose, natural chocolate flavor, natural cocoa powder, Lo Han (Momordica grosvenorii), vanilla flavor, Fibersol-2®, and guar gum and lecithin (from soy). Allergen Warning: Produced in a facility that also processes egg, wheat, and shellfish products. This is probably one of my favorite protein mixes out in the market. It actually tastes like chocolate and is delicious. You can mix it with anything from yogurt or turn it into a smoothie. Whey Protein Chocolate - is shipped in a discrete, unmarked package. Orders are processed immediately and usually take about 3 to 5 working days to be received. We do ask that you try it for 2 to 3 weeks to feel the full effects. Any information received is used only for order processing and shipping purposes. Your information, such as e-mail address, will never be disclosed to a third party.